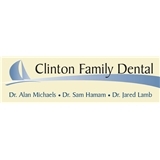 Clinton Family Dental (Clinton) - Book Appointment Online! Please arrive 15 minutes earlier than scheduled appointment time. Our approach to dentistry is to offer our patients a balance of quality, value, personalized care and clinical excellence. Clinton Family Dental offers comfortable dental treatment, quality materials and easy to understand treatment options in a comfortable setting. You will find the atmosphere of our office to be efficient and friendly. Our team is eager to share our extensive knowledge and experience with you. At Clinton Family Dental, our team is always willing to discuss the benefits, disadvantages or risks of treatment. It is our collective goal to provide the best dental care for your long term dental health. Professional, informative, all around very good. My family and I have had nothing but great experiences with Dr. Lamb. I recommend him and his team to many people. I have small children ranging from the ages of 3 - 16 and they all come out smiling and excited for their next visit each time. He and his team are caring from the moment you walk through the door. If you are looking for some great dental care, this is the place to be! --Christy B.